Uranus’ moon Cressida would float if placed in water, according to new research, which has recorded the first measurements of the satellite’s mass and density. Robert Chancia of the University of Idaho and colleagues calculated Cressida’s density and mass using variations in an inner narrow ring of the planet as Uranus passed in front of a distant star. The analysis came from both ground-based and Voyager stellar and radio occultations of the Uranian rings, spanning the period from 1977-2002. The team found that the density of the moon is only 0.86 grams per cubic centimeter while its total mass is around 250 exagrams ( 2.5 x 10^17 kilograms). This suggests the moon is made of water ice with some contamination by a dark material, according to Science News. Cressida was discovered along with several other moons from the images taken by Voyager 2 during it flyby of Uranus in 1986. The planet has a total of 27 moons – the majority of which have been named after characters from William Shakespeare plays. The moons orbit within the tight space of 20,000 kilometers of Uranus putting them on direct collision courses. In 1997 scientists estimated that another moon spotted by Voyager 2, Desdemona, would collide with Cressida within the next 4-100 million years. These new calculations suggests the collision could happen in a million years, Science News noted. The researchers say getting a better grasp of inner Uranian satellite masses and what they are made of will provide a better understanding of the tightly packed system of small moons and their fate after a collision. Chancia and his team have been studying Voyager 2’s old data for some time looking for patterns and structures in Uranus’ rings that would help uncover the planet’s secrets. 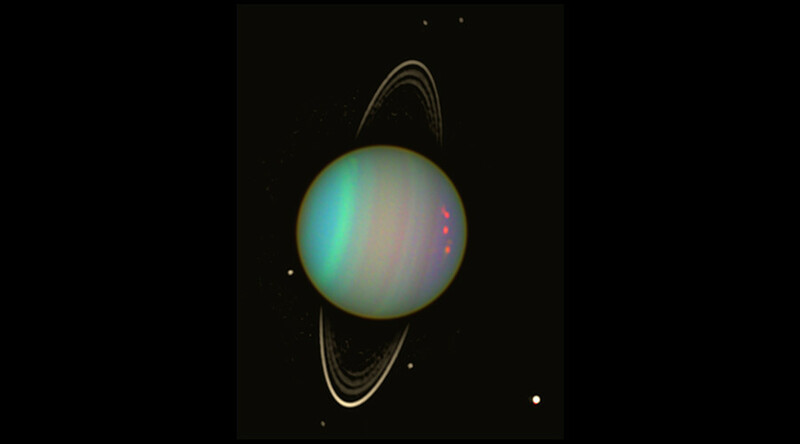 Last year they spotted patterns in it to suggest that Uranus has two undiscovered moonlets. The tiny moons were discovered behind the planet. Details of the latest observations are available on the Cornell University repository arXiv.org and will be published in the Astronomical Journal.